For until a short time ago Ludwig Thuille was a shadowy figure encountering the reader of yellowed books. The reference to his historical importance as head of the ‘Munich School’ did not mean much, It is only Thuille’s correspondence with Richard Strauss that has kept his erstwhile significance alive. Signs of their friendship were the almost contemporaneous settings of specific poems, how good it would have been to be present when Thuille and Strauss presented their Lieder to each other and discussed their findings. 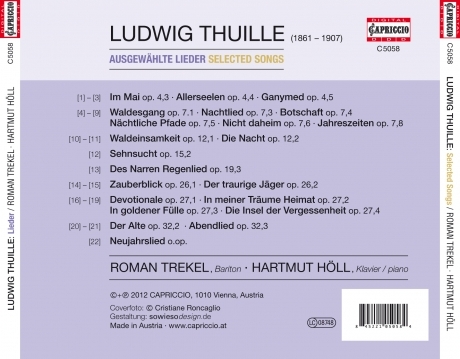 In the meantime, the situation has changed, and an updated discography would cover recordings of many of Thuille’s works. 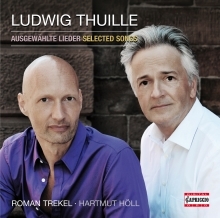 Campaigned for his Lieder, now, Roman Trekel and Hartmut Höll are for the first time presenting an album in the instrumentation for male voice and piano.